Custom-made orthotics are designed to align and stabilize the foot and ankle while reducing impact and vibration from the ground. Although our orthotics look like insoles, they’re biomechanical medical appliances that are custom to your individual foot. At Complete Care Chiropractic our custom made orthotics are designed from both precise 3D foam imprints of your feet as well as your functional gait cycle data. Like the foundation of a house, your feet support the weight of everything above them. When a small problem in one or both feet develops, a subtle change in the way you walk will cause a chain reaction in your posture. These changes can put stress on the knees, hips and pelvis, which often lead to secondary problems. When you come in for your orthotic assessment, we’ll take a detailed health history and perform a physical examination with a focus on posture and lower limb biomechanics. We’ll then do a state-of-the-art scan of each foot using TOG GaitScan technology. The TOG GaitScan is an innovative diagnostic tool and digital casting device that allows us to accurately assess your feet. The process is simple: As you walk over a mat-like structure that contains thousands of sensors, the device maps what your feet are doing at that moment in time. 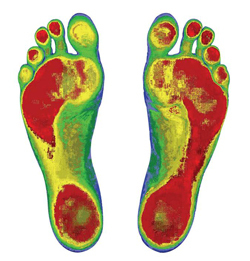 It measures differing amounts of pressure exerted by each foot, timing, how long the foot remains in each stage of the gait cycle, the amount of weight carried by each foot, high and low-pressure areas and center of gravity data. This invaluable information, which includes over a million points of data, allows us to provide you with the perfect fit in your new set of orthotics. If you’re suffering with stubborn foot, knee, hip, or even back pain, contact us today to see how we can help!